A gastric balloon is a small silicone pouch filled with a sterile salt water solution. It is inserted into your stomach via your mouth to limit your food intake, helping you to lose weight. You can expect to lose around 30% of your excess body weight with a gastric balloon, but you must stick to a strict regime of dieting and exercise in order to reap its benefits. Gastric balloon surgery costs roughly £4,500 in the UK. If you are concerned that you cannot afford the procedure, many weight loss surgery clinics provide financial assistance to help you to spread the cost. Gastric balloon surgery is a quick weight loss procedure that delivers noticeable results over a short period of time. Patients with a gastric balloon can typically expect to lose up to 30% of their excess body weight, when combined with a healthier diet and frequent exercise. During the gastric balloon procedure, a small silicone balloon is inserted orally into your stomach. Once in position, it is then inflated using a sterile saline (salt water) solution and left to float freely within the abdomen. Because the balloon takes up a large proportion of your stomach, you feel full much quicker meaning you eat much smaller portions than before. This restriction on food intake therefore means that you lose weight. The balloon is intended to remain in your stomach for approximately six months before it needs to be removed. This is because the acid in your stomach will gradually erode the balloon, making it unsafe to stay inside you for any longer. 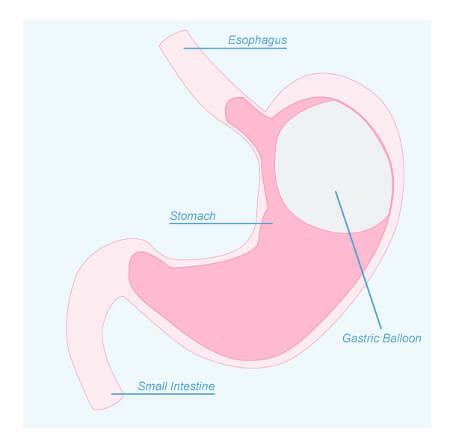 A gastric balloon is also suitable for those who are worried about undergoing surgery, since this procedure does not require you to go under the knife – you simply insert the gastric balloon into the stomach via the mouth! The gastric balloon procedure may also be recommended for those who have a very high BMI who need to lose some weight before they can safely undergo further weight loss surgery, such as a gastric sleeve. Eligibility criteria can vary slightly depending on the private clinic you choose. You should book a consultation with a surgeon to discuss your suitability for gastric balloon surgery. Bear in mind that you will not need a GP referral to have a gastric balloon fitted at a private clinic. The average price for a gastric balloon in the UK is approximately £4,500, although prices can start from as little as £4,000 and increase to over £6,000 depending on which clinic you attend. However, it’s important to note that the actual price you will pay is determined on an individual basis following a consultation, so you may find that the amount you’re quoted is different from a clinic’s advertised price. We’ve compared the average price of gastric balloon surgery across some of the UK’s leading weight loss clinics, helping you to identify which practitioner is best for your budget. If the cost of a gastric balloon is putting you off having the treatment, finance is an option. Private clinics recognise that for many patients, paying out a lump sum is not feasible. Gastric balloon finance offers you assistance in paying for the procedure, allowing you to spread the cost of the treatment while still reaping its benefits. Each finance option will vary depending on the private clinic you have selected. You’ll usually be required to pay a deposit before the surgery is conducted, which is worked out as a percentage of the total cost of the procedure. You’ll then make monthly instalments after the surgery at a pre-agreed amount to cover the remaining cost. The monthly instalments typically have an interest rate (APR) added to them, although some clinics do offer 0% APR finance options. If you’re interested in gastric balloon finance, you should speak to your clinic about the financial assistance that they offer. They may be able to offer you an in-house option and start the process immediately, or point you in the right direction to a third-party provider. If you’re looking for a clinic that can offer you attractive rates, we’ve found some of the best finance deals on offer from quality practitioners. The thought of having gastric balloon surgery can worry many people, but it is the quickest and safest weight loss procedure available today. The insertion of a gastric balloon only takes approximately 30 minutes and is carried out on an outpatient basis, meaning you can return home on the same day (if your surgeon is satisfied that the surgery went well). We have produced a step-by-step guide that advises you on what to expect before, during and after the surgery. You will attend an in-depth consultation with your surgeon and other health professionals who will discuss with you the gastric balloon procedure and your suitability for the treatment. You will then be invited to attend a pre-operative assessment at your local clinic or hospital. At this assessment you will be asked about your medical history as well as undergoing a series of tests including a blood test and x-ray. In the weeks leading up to your surgery, you will be placed on a healthy eating and exercise plan to ensure you are in the best health possible. On the day of your gastric balloon surgery, you will be required to stop eating and drinking for six hours before the procedure is scheduled. This is to ensure that the stomach is empty when the gastric balloon is inserted. You will then be required to sign a consent form to give the surgeon permission to perform the procedure, before you will be placed into a gown and compression stockings to prevent your blood from clotting. You will be given a mild sedative drug to make you feel sleepy throughout the procedure. Because the balloon is inserted into your stomach through your mouth and oesophagus, you will also be given a numbing throat spray to make it easier to swallow the balloon. Your surgeon will perform a health check of your stomach using an endoscopy, in which a thin tube with a light and camera at the end of it is inserted into your body and the images are relayed back to a television screen. If your stomach is deemed healthy, your surgeon will proceed with the insertion of the gastric balloon. You will then be given the balloon which you will be asked to swallow. Once inside the stomach, your surgeon will inflate the balloon with a sterile saline (salt water) solution via a small filling tube (catheter) attached to the device. Once the balloon is fully inflated, the catheter will be removed and a self-sealing valve on the balloon will prevent the saline solution from leaking. You will be taken to a recovery room where you will be given small sips of water to drink as well as painkillers to remove any discomfort. Once you are able to, you will be encouraged to move around to encourage blood flow and reduce the risk of blood clots. If your surgeon is happy with how the procedure has gone, you will be discharged from the clinic or hospital and allowed to return home on the same day. You will not be able to drive, so should arrange an alternative form of transport. On your departure, your surgeon will give you a set of aftercare instructions that will advise you on what you should do once you are home. You should follow these instructions carefully to minimise the risk of any complications developing and ensure the best recovery. The recovery time following gastric balloon surgery varies from person to person, with some finding it much easier to adjust to having a foreign object in their stomach than others. In some cases, it can take up to a week for the balloon to feel comfortable. Once you have got used to the balloon, you will be able to return to your normal activities. You will be placed onto a strict diet plan that will allow your body to adjust to the balloon. Immediately after the procedure, you must only consume fluids before gradually building up to soft foods and then returning to normal solid foods. This diet must be adhered to in order to avoid any unpleasant side effects such as nausea and vomiting. You may also be prescribed multi-vitamin and mineral supplements while the gastric balloon is in your stomach. You will be required to meet with your dietician regularly following your surgery to check on your progress and ensure you are consuming a balanced diet. Bear in mind that you will feel full much more quickly than before, so your portion sizes should be much smaller. During the recovery period you should also be mindful of exercise. While it is advised that you should avoid any unnecessary physical activity in the first week, you should gradually increase your exercise to at least a 30 minute walk each day. This should be at a brisk pace where you feel sweaty and short of breath. You’ll no doubt be thinking about the weight loss results you can achieve. Over an average six month treatment period, you can expect to lose up to 30% of your initial body weight at around 2-3lbs each week. It might be some time before you see noticeable results, but with the right healthy eating and exercise plan in place you will lose weight. Damage to the oesophagus or stomach: because the balloon is inserted into your stomach through the mouth, this can cause internal injury including bleeding and ulcers. If this occurs you may require emergency surgery. Infection: once inserted into your stomach, you may develop an infection caused by bacterial growth within the balloon. Typical symptoms of infection include nausea, cramping and diarrhoea. This can be easily treated with a course of antibiotics. Intestinal obstruction: the gastric balloon can rupture and deflate inside your stomach, although this is very rare. When this occurs, the balloon can begin to pass through your intestines and cause a blockage. This is a medical emergency and will require surgery to remove the balloon from your digestive system. Unfortunately some of these complications can occur regardless of whether you follow the post-operative aftercare advice given to you by your surgeon. It is therefore imperative that you monitor your symptoms following your gastric balloon surgery, and contact your GP or NHS 111 immediately for medical advice if you don’t feel well. A gastric balloon is usually removed six months after the initial procedure has been completed, although it can be removed earlier if necessary. The removal process takes approximately 10 minutes to complete, and you can return home on the same day. It is removed from your stomach in the same way that it was inserted – via your mouth, so there is no need for any invasive surgery. A catheter will be fed into your mouth and down into your stomach, where it will be used to puncture and deflate the balloon. A special surgical instrument will then be used to retrieve and remove the decompressed balloon from your stomach. Be aware that once the gastric balloon is removed, your stomach will return to its normal size and food intake is not restricted. Because of this, some people do regain their weight if they do not continue to eat a balanced diet and exercise frequently. There are some alternatives to choosing a gastric balloon. You might also be eligible for other surgical weight loss techniques including a gastric band, a gastric bypass or a gastric sleeve. These are a more invasive option than a gastric balloon however, with more serious risks and a bigger price tag. Instead, the simplest way to lose weight is by adopting a healthier lifestyle such as improving your diet and exercising more often. This technique should be tried before you consider having a gastric balloon. However, gastric balloon surgery can support those who have struggled to lose weight through this method. Which treatment option is right for you will depend on your personal circumstances. You should discuss your options with a professional first before making a decision.